Auburn University’s music education faculty members are committed to increasing and improving music education at local, state, and national levels. Their focus on outreach stems from strong beliefs that all children deserve quality music education from teachers certified to teach music, that all teachers deserve to have the best and most current teaching knowledge and tools, that future music teacher educators should be supported and mentored so they can grow professionally, and ultimately that future music educators deserve excellent teaching opportunities for growth and development. These beliefs are shown through their outreach work in Tiger Strings, The Loachapoka String Project, Beethoven & Me, the Alabama Music Educators Association, the National Association for Music Education (NAfME) and the College Music Society (CMS). Ultimately their work demonstrates their commitment to quality music teaching at all levels, and the real-world teaching experiences Auburn University music education students have makes them some of the most sought after teachers in the southeast. Recently music education faculty and students presented workshops at both the state and national levels. In October 2013, Dr. Jane Kuehne and Mr. Robert Lyda presented a workshop on using iPads to teach elementary general music to a crowd of approximately one hundred teachers at the National Association for Music Education (NAfME) National Conference in Nashville, Tennessee. They expanded their workshop and presented it to over 200 Alabama music educators in January 2014 at the Alabama Music Educators Association (AMEA) Annual Conference in Montgomery, Alabama. Also at AMEA, Dr. Kuehne also presented a workshop to approximately 50 teachers on using cloud-based music applications in teaching music at all levels, and Dr. Lisa Caravan, and Mrs. Katherine King presented workshops on string techniques for several Alabama string teachers. Dr. Nancy Barry has been active in mentoring higher education faculty members through her work at Auburn University and through her active membership in the College Music Society (CMS) Mentoring Committee, for which she is also the past chair. Through the CMS Mentoring Committee, Dr. Barry works with graduate students and new higher education faculty members in music and music education to help them realize their potential by understanding how to thrive as a higher education faculty member. Her expertise in this area has been invaluable not only for CMS membership, but also for graduate students and new faculty at Auburn University. Tiger Strings continues to grow in membership through the efforts of Dr. Lisa Caravan, and co-founders Mrs. Katherine King and Dr. Kimberly Walls. The program has been supported over time through different grants and through funds from the Department of Curriculum & Teaching in the College of Education and support from our colleagues in the Department of Music in the College of Liberal Arts, who have provided rehearsal space. The program has grown from one ensemble to include a smaller advanced string program, a winds program (tentatively called Tiger Winds), and a beginner string program. Through the extensive efforts of Mrs. Katherine King, the Loachapoka String Project includes more students that receive free string instrument training. Mrs. King, the program works with administrators at Loachapoka Elementary to find ways to provide training at times for students to take string instruction and to make learning a string instrument exciting and motivating! Upon completing her dissertation, Mrs. King will begin collecting data to better understand ways to make this program grow. Beethoven & Me, recognized for excellence in 2010 by the College Music Society, focuses on children’s and future music educators’ musical composition creativity. This project is a collaboration between Auburn faculty member Dr. Jane Kuehne, Notasulga K-12 music educator Mr. Robert Lyda, and Auburn University undergraduate music education students. This spring 2014, Auburn music education students will work with elementary students at Notasulga K-12 to create original musical compositions. Each elementary student will compose a short melody (theme) and the undergraduate students will use those melodies as the main themes for their own compositions designed for the elementary students to perform. 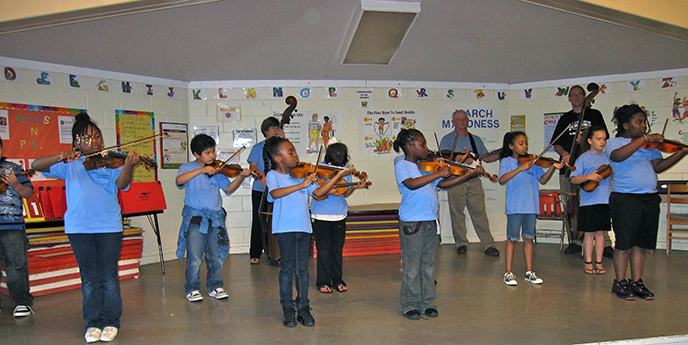 The music education students will teach selected compositions to the elementary students and present them in a performance for their parents and school. This spring Dr. Kuehne and Mr. Lyda will collect data to determine undergraduates’ views on teaching composition and performance to elementary-aged students, and to try to better understand the impact of the program on both the elementary and undergraduate students. This data along with previously collected data will help to determine trends from year-to-year.